On 23 January 1915 the British Grand Fleet under Admiral Sir John Jellicoe had 18 dreadnoughts ready at Scapa Flow and eight King Edward VII class pre-dreadnoughts and five battlecruisers at Rosyth in the Firth of Forth. The battlecruisers had been moved there from Cromarty after the German raid on the north east coast on 16 December 1914 so that they could respond more quickly to future attacks. Jellicoe thought that his margin over the German High Seas Fleet was too narrow. It had 17 dreadnoughts, 22 pre-dreadnoughts and four battlecruisers. There were other British pre-dreadnoughts on the Channel Fleet, but these were not under his command. Jellicoe always counted the number of ships that he had actually available, excluding those under repair or refit or newly built ones that we not fully worked up. He assumed that the Germans would not come out unless they were at full strength, which proved not to be the case. The British battlecruisers, commanded by Vice Admiral Sir David Beatty, had recently carried out a sweep into the Helgoland Bight, but had not encountered the enemy. They returned to base on 20 January 1915. The Germans planned an operation of their own for 23 January. The battlecruisers of Admiral Franz Hipper’s 1st Scouting Group of three battlecruisers and the armoured cruiser SMS Blücher, the four light cruisers of the 2nd Scouting Group and two flotillas with a total of 18 torpedo boats would carry out a reconnaissance towards Dogger Bank. The Germans called their destroyers as torpedo boats. He was reluctant to carry out such an operation at a time when the rest of the High Seas Fleet was not in a state of preparedness to support it. However, he agreed because he assumed that the Grand Fleet would be in port coaling, as it had carried out a sweep of the North Sea on 19 January. The Germans had begun to realise that the British had accurate intelligence on their movements, but did not suspect that it came from reading coded German signals. They believed instead that trawlers or possibly dockyard spies were responsible. A 1922 German analysis of the battle states that it the war it had then ‘only recently transpired’ that the Russians had recovered the code books of the German light cruiser Magdeburg in August 1914 and shared them with their allies. The British intelligence slightly over estimated the strength of Hipper’s force at four battlecruisers, six light cruisers and 22 torpedo boats. Jellicoe’s assumption that the Germans would come out only when all their ships were available was wrong, since the battlecruiser SMS Von der Tann was in dry dock. This was for a routine overhaul, and the story that she was being repaired after colliding with another warship during the Cuxhaven Raid is wrong: it came from prisoners taken at Dogger Bank who either lied to mislead the enemy or else repeated false gossip. Beatty had the five battlecruisers of the 1st and 2nd Battle Cruiser squadrons and the four ships of the 1st Light Cruiser Squadron under his command: a sixth battlecruiser, HMS Queen Mary, was undergoing maintenance. He was ordered to rendezvous with the three light cruisers and 35 destroyers of Commodore Reginald Tyrwhitt’s Harwich Force at 7:00 am on 24 January near Dogger Bank. The King Edwards of the 3rd Battle Squadron and the armoured cruisers of the 3rd Cruiser Squadron were positioned about 45 miles northwest of the rendezvous point in case the Germans were driven north. Four submarines were sent to intercept the Germans on their way home, but received the signal too late to do so if they got back to port before dusk on 24 January. Jellicoe and the rest of the Grand Fleet were ordered to sea, but too late to make the action. He later complained that his ships could have been at Beatty and Tyrwhitt’s rendezvous point by 9:30 am on 24 January had he been told to raise steam as soon as the Admiralty learnt that of the German operation. In the event, his ships were 140 miles away from the battle. The light cruiser HMS Aurora of the Harwich Force came into contact with the Germans just before sunrise. Beatty headed South South East at full speed in the hope of getting to the south of the Germans and cutting them off from their bases. Even if a chase developed, the wind would be blowing the smoke of the coal fired ships towards the Germans, giving the British an advantage on visibility, The Germans were in sight at 8:00 am and the British fired their first ranging shots at 20,000 yards at 8:52 am. The British ships were sailing in the order Lion (Beatty’s flagship), Tiger, Princess Royal (these three all had eight 13.5 inch guns), New Zealand (Rear Admiral Sir Archibald Moore, commanding 2nd Battle Cruiser Squadron’s flagship) and Indomitable (the last two both had eight 12 inch). The German order was Seydlitz (Hipper’s flagship with 10 11 inch), Derfflinger (eight 12 inch), Moltke (10 11 inch) and Blücher (12 8.2 inch). Blücher was outclassed, but the smaller guns of the German ships were otherwise counter-balanced by superior armour. Beatty’s despatch claimed that Lion achieved a speed of 28.5 knots, although the highest given in her log was 27 knots. Indomitable could make only 25 knots. so fell behind. New Zealand claimed to have managed 27 knots, a knot faster than in her trials two years before. At 9:52 am Beatty had to slow down to 24 knots so that his squadron could keep close enough together to support each another. The German claimed maximum speeds of about 28 knots for their three battlecruisers, but they were held back by Blücher, which managed only just over 22 knots, below her designed speed. The German squadron stayed together until 9:30 am, when the battlecruisers increased speed to 23 knots, pulling away from Blücher. By 09:05 am all three 13.5 inch gun ships were firing on Blücher. The two 12 inch armed ones were still out of range. 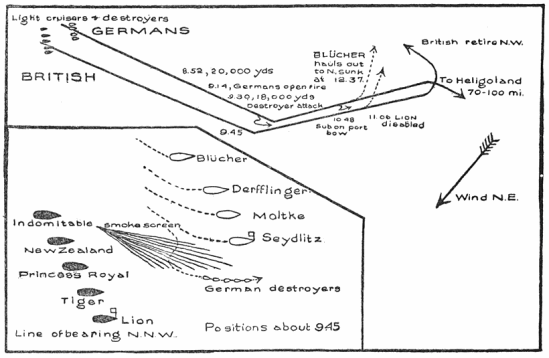 At 09:24 am Lion switched her fire to Derfflinger. The three German battlecruisers were all firing on Lion. At 09:35 am Beatty ordered his ships to fire on their opposite number in the enemy line. This should have meant Lion at Seydlitz, Tiger at Moltke, Princess Royal at Derfflinger and New Zealand at Blücher; Indomitable was out of range. However, Tiger, not realising that one British ship was not able to fire, targeted Seydlitz, meaning Moltke was not being fired at and creating spotting problems for Lion and Tiger. At 09:43 am Lion hit Seydlitz’s aft turret, creating a cordite fire that put the two aft turrets out of action and required the flooding of the magazine. However, Lion was suffering heavy damage and started to lose speed from 10:45 am. Blücher, which by then was on fire, turned north in an attempt to escape at about the same time. At 10:54 Lion thought that she had spotted a periscope, almost certainly wrongly as the German Official History later stated that there were no U-boats in the area. Beatty therefore ordered a turn to port, taking the course to North North East . Hipper ordered a torpedo boat attack on the battlecruisers at 11:00 am, but it was cancelled at 11:07 am because of their change of course. Lion had been hit 15 times, her port engine was stopped, all her lights were out, her speed was down to 15 knots, she was listing 10 degrees to port, her searchlights and wireless were out of action and she had only two signal halliards. Beatty’s intention was that the squadron should head north east, taking it clear of any mines that he wrongly feared the German torpedo boats might have dropped, and cutting Blücher off from the German battlecruisers. However, Blücher was north east of the British squadron and Moore, who was now in command since Lion could not keep up, did not know why Beatty had ordered the earlier turn. Beatty’s first two signals were interpreted as a single one: ‘Attack the rear of the enemy bearing north east.’ The British battlecruisers therefore pounded the stricken Blücher to destruction, whilst the rest of the German squadron escaped. They fired on Tiger for a while, hitting her seven times and putting one turret out of action, before moving out of range to the south east. Blücher was now under attack from four battlecruisers and several light cruisers and destroyers. She was still putting up a fight and badly damaged the destroyer HMS Meteor, but stopped firing at 11:38 am after the light cruiser HMS Arethusa put two torpedoes into her. At 11:40 am the battlecruisers headed south east in pursuit of the Germans. Five minutes later Tyrwhitt reported that Blücher had struck her colours. The British then began to rescue survivors, observed by a Zeppelin that had been fired on by the light cruiser HMS Southamption around 10:30 am. A German seaplane appeared at 12:30 pm and dropped bombs. The rescue effort was called off at 12:40 pm, by when most of the men in the sea had been either rescued or killed by the bombs. Presumably the seaplane crew assumed that the sinking ship was British. She was then the only large German ship with a tripod mast, but all British dreadnoughts and battlecruisers had tripod masts. Beatty had meanwhile called for the destroyers to come alongside Lion. At 11:25 am he transferred his flag to the destroyer HMS Attack, which took him to HMS Princes Royal. He was onboard her by 12:20 pm, but it was now too late for the British to catch the Germans. Dogger Bank was a clear British victory, with a German armoured cruiser and no British ships sunk. It could have been a greater victor had the British battlecruisers pursued the retreating Germans. It is possible that the a pursuit might have turned victory into defeat, given the way in which three British battlecruisers would blow up at Jutland in 1916. ‘Great damage was done by a shell which hit her aftermost turret and exploded the ready ammunition (6 rounds per gun) stowed there. A flame rose mast high and also went down the ammunition hold, causing the magazine to be flooded hurriedly to save the ship. The entire turret’s crew, including the men in the magazine perished. Informant could not remember if a fire was actually started. 1. At the top and bottom of all cartridge hoists double flap doors were fitted through which every cartridge has to pass. 2. Similar doors were fitted to the projectile hoists in the turrets and working chambers, but not in the shell rooms. 3. The ready supply of six rounds in the turret was abandoned. 4. The hatchways to magazines and shell rooms were ordered to be kept closed while at sea, and the only exits from these compartments is then by way of an escape through the central hoist into the turret. The British had also had a chance to learn from their mistakes when HMS Kent was saved from blowing up at the Falkland Islands by the courage and quick thinking of Royal Marine Sergeant Charles Mayes, but did nothing other than awarding Mayes the Conspicuous Gallantry Medal. Naval-History.net lists lost 14 British killed and 29 wounded: 17 wounded on Lion, 10 killed and 11 wounded on Tiger and 4 killed and one wounded on Meteor. Lion had to be towed back to port by Indomitable, and took four months to be repaired. German casualties were 959 killed, 90 returned to port wounded and 234 captured, 45 of them wounded: 792 killed and all the captured on Blücher, 159 killed and 88 wounded on Seydlitz and 8 killed and two wounded on the light cruiser SMS Kolberg. Seydlitz was ready for sea on 1 April and Derfflinger on 17 February. The battle resulted in von Ingenohl being replaced as commander of the High Seas Fleet by Admiral Hugo von Pohl on 2 February. Moore, who was deemed to lack the initiative required to command a battlecruiser squadron, was transferred to command a cruiser squadron in the Canaries. Admiral Lord Fisher, the First Sea Lord, wanted to dismiss Captain Henry Pelly of Tiger, who had fired on the wrong target and then should, according to Fisher, have disobeyed Moore’s orders and continued the chase. Fisher, looking back to Lord Nelson, said that ‘In war the first principle is to disobey orders. Any fool can obey orders!’ Tiger’s gunnery was also poor, but Pelly kept his job. Another who retained his position was Lieutenant Ralph Seymour, Beatty’s Flag Lieutenant. He had made a crucial signalling error during the pursuit of Hipper’s squadron after the North East Raid and was clearly not good enough at signalling to do the job. He had other duties, such as being the admiral’s social secretary when ashore, but signalling was by far the most important task. Beatty, who was loyal to his immediate subordinates, liked him. However, if he did not want to fire Seymour he could have arranged to promote him away to a destroyer command, but he kept him on to make more mistakes at Jutland. Dogger Bank was a British victory, but it was one that glossed over many problems, such as poor gunnery, dangerous ammunition handling procedures and signalling errors. Derfflinger was hit once, which set her on fire. Seydlitz was hit only twice, but the almost catastrophic nature of one of the hits caused the Germans to correct mistakes in their anti-flash procedures, which the British did not do. J. S. Corbett, H. Newbolt, Naval Operations, 5 vols. (London: HMSO, 1938). vol. ii, p. 82. The National Archives (TNA), Kew, CAB 45/284, ‘German Navy and Sources of Material: Dogger Bank Action, 1915: Translation of German Account, by Commander Groos’ Quoted in ‘The Action of the Dogger Bank 24th January, 1915’ by Commander Groos, ‘Marine Rundeschau’, March 1922, p. 22. K. Yates, Flawed Victory: Jutland, 1916 (London: Chatham, 2000), pp. 79-80. CAB 45/284, p. 4. Footnote. Corbett, Newbolt, Naval, p. 84. R. D. Layman, The Cuxhaven Raid: The World’s First Carrier Air Strike (London: Conway Maritime Press, 1985), pp. 118-20. Naval Staff Monograph (Historical) vol. iii. p. 211. A. J. Marder, From the Dreadnought to Scapa Flow; the Royal Navy in the Fisher Era, 1904-1919, 5 vols. (London: Oxford University Press, 1961-70). vol. ii, p. 157-58. Except where otherwise stated, the description of the battle is based on Naval Staff vol. iii. pp. 212-17. Note that there are a number of alterations to the text, some hand written, some printed and attached to the original text, in the copy consulted. Corbett, Newbolt, Naval, p. 97. Footnote 1. R. K. Massie, Castles of Steel: Britain, Germany, and the Winning of the Great War at Sea (London: Jonathan Cape, 2004), p. 407. Marder, From. vol. ii, p. 166. Corbett, Newbolt, Naval. vol. ii, p. 102. Quoted in Marder, From. vol. ii. p. 169. Italics in Marder. G. A. H. Gordon, The Rules of the Game: Jutland and British Naval Command (London: John Murray, 1996), pp. 93-97. Marder, From. vol. ii, pp. 164-65.